A loom used to hand-weave textiles for Leandi's designs. Mohair is considered one of the world’s most luxurious natural fibres and South Africa farms a large portion of the world’s mohair. South African designers, Frances van Hasselt and Leandi Mulder, have embarked on a journey to reinvent this natural fibre, as realised through their bespoke collection, FRANCES V.H X LEANDI MULDER. 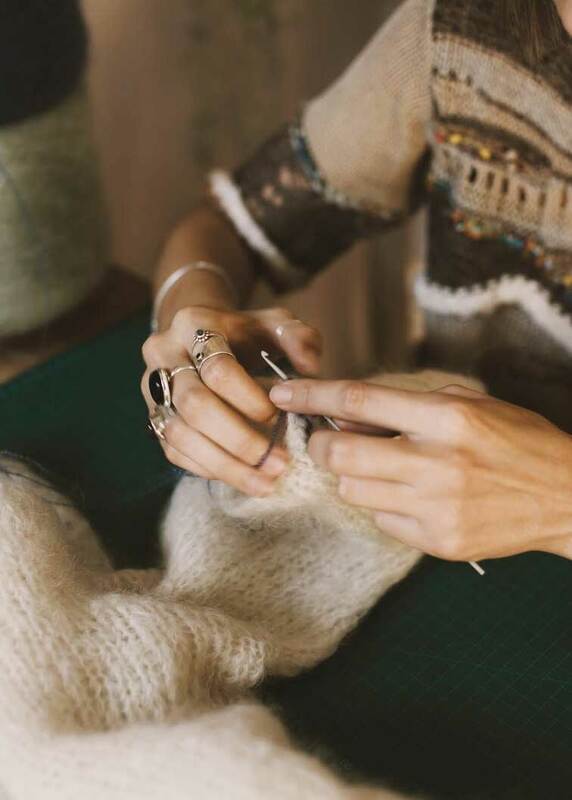 Their unique pieces are created from mohair farmed in South Africa, hand-knitted locally by rural craftspeople, and designed to be passed on through the generations. Frances has a close connection with the fibre and comes from a family that farms with one of the oldest Angora goat studs in the Karoo. She founded FRANCES V.H Mohair Rugs after returning from working in the fashion industry in Hong Kong. 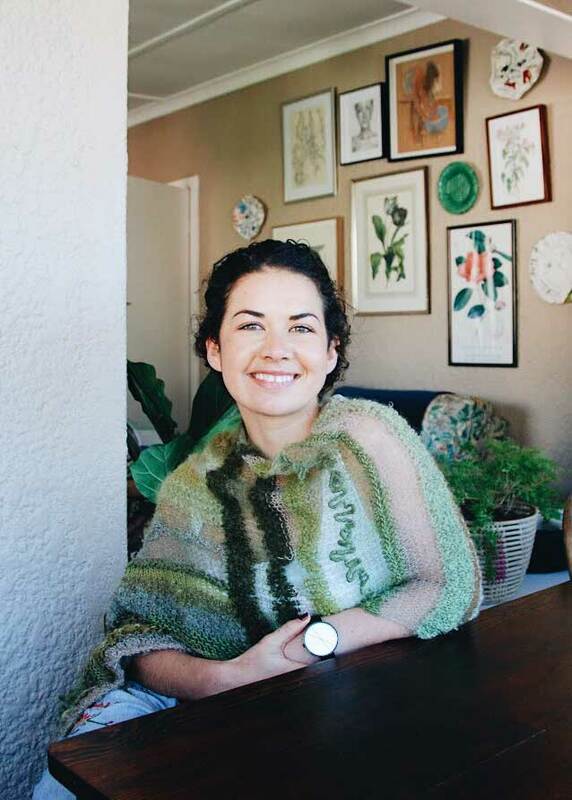 Her business partner, Leandi Mulder, is a fashion designer from Durban, whose creations focus on sustainable practices and unique textile construction. Leandi too has an interest in knitwear and places great importance on working with natural fibres like mohair. The two have had a long-standing friendship, sharing passionate interests in fashion, innovation, sustainable design and South African mohair. This has led them on a journey of creating a knitwear collection of unique mohair pieces that hopes to inspire a new reverence around the potential of this fibre. Their hope is to create a fresh identity for South African mohair garments while honouring the maker, farmer, animal, and land from which mohair takes root. Through this collection, they also hope to show consumers a new way of looking at their clothes; a transparent supply chain where garments are fully traceable. So far, the pair has created a few pieces for their first collection, with plans in motion to officially launch the full range in the upcoming months. Why did you choose the natural fiber, mohair? Frances: South Africa is home to the majority and highest quality mohair in the world, most of which comes from the Karoo. That said, very few South Africans experience high-end mohair products. This is mainly the result of us exporting most of our raw mohair, making it difficult for South Africans to see how mohair is used and how versatile it is. Despite this, we believe that South Africa can and should get to a point where it is associated with high-quality mohair end products in the same way Cashmere is to Scotland and Alpaca to Peru. Leandi: When we started researching local production, we battled to find readily available resources and companies that could assist us with knowledge and knitwear manufacturing. After our textile crash in the 90’s very few South African knitwear companies are still in operation. The few that survived struggle to produce with fairly small and expensive runs of mohair knitted garments. However, we both felt strongly that we needed to find an alternative way to celebrate this fibre by creating a collection locally. Leandi in her creative Durban studio. Frances: We’re currently in the development phase of our collection - FRANCES V.H X LEANDI MULDER. 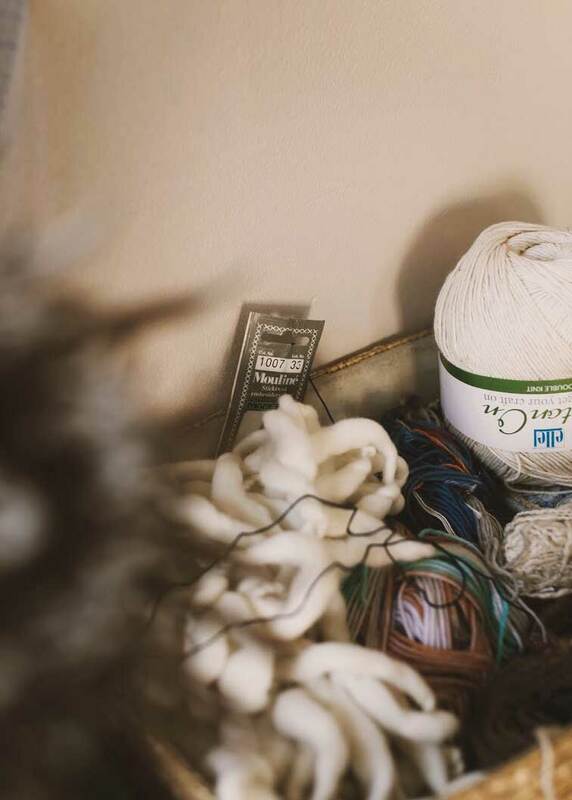 Our vision is to use mohair from my family’s farm in the Karoo, hand-spin and dye the yarn to finally create one-of-a-kind pieces knitted by skilled rural artisans. This creates a sustainable value chain where nothing is mass-produced and every piece varies from the next. This collection has been a collaborative effort in the truest sense of the term and the project would not have come to fruition without the combination of our diverse skill sets, time and obsessive passion for the project. Frances: For us to understand what could be done with mohair, we applied to do a residency at a leading luxury textile house in Japan that focussed on specialised yarns, particularly mohair. Sato Seni, a fourth generation family run business, is based in the rural Japanese city of Sagae, Yamagata. Nothing could have prepared us for this experience, which was completely immersive, inspiring, educational and creatively stimulating. Our time at Sato Seni ignited many emotions and friendships over the course of this one-month residency. Masaki Sato, president of the company, was one of the most inspirational people we have ever met. He has a fierce passion for knitwear innovation and a deep understanding of the origins of materials. Masaki sources the best natural fibres straight from farmers across the globe. He does not believe that fashion can grow if agriculture and farming don’t benefit simultaneously. 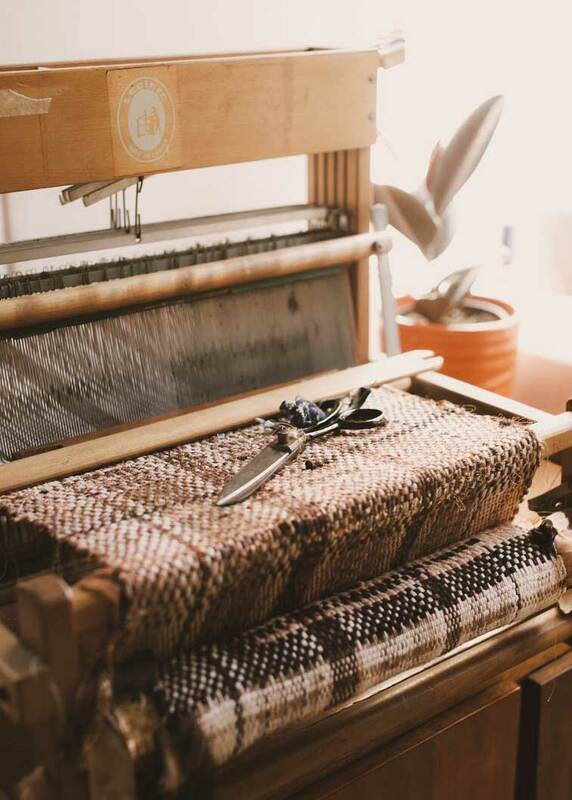 This is the basis for the creation of their artisanal yarns, which then follows a unique in-house supply chain; with their own dying and spinning factory, design team and knitwear department. Masaki taught us to look at what we had in front of us and not try to replicate or compete with the strengths of others. It is with this in mind that we returned home to start working on what would become FRANCES V.H X LEANDI MULDER. After we came back to South Africa, we wondered how we were going to produce quality garments from mohair. Collectively, we decided to break down the process and see what was needed. This meant there had to be a mentality shift — to stop looking at what we don’t have and start looking at what we do have and the things that make us unique. We don't have cutting-edge machinery or fast production but we do have amazing agriculture, the world’s best natural fibres and a group of artisans sitting in rural communities with years of dyeing and spinning experience but few job opportunities. In South Africa, the craft and creative industry is an untapped opportunity, with very limited links to the modern marketplace. If we can find ways to connect people and their skill sets to a marketplace, we believe it has the potential to boost the textile industry and our economy. We were extremely excited to find Adele Cutten of Adele’s Mohair, who is part of a group of women in the Eastern Cape that specializes in hand dyed and hand spun yarn. With the help of Adele and her amazing products, our collection became a reality. How were the garments in your collection created? Leandi: We created storyboards with our designs drawing inspiration from South African landscapes. We then travelled to Adele’s studio in the Eastern Cape to finalise the silhouettes and to hand select yarns in the development of colour stories for the garments. Adele works from an incredible location, situated just outside of East London. 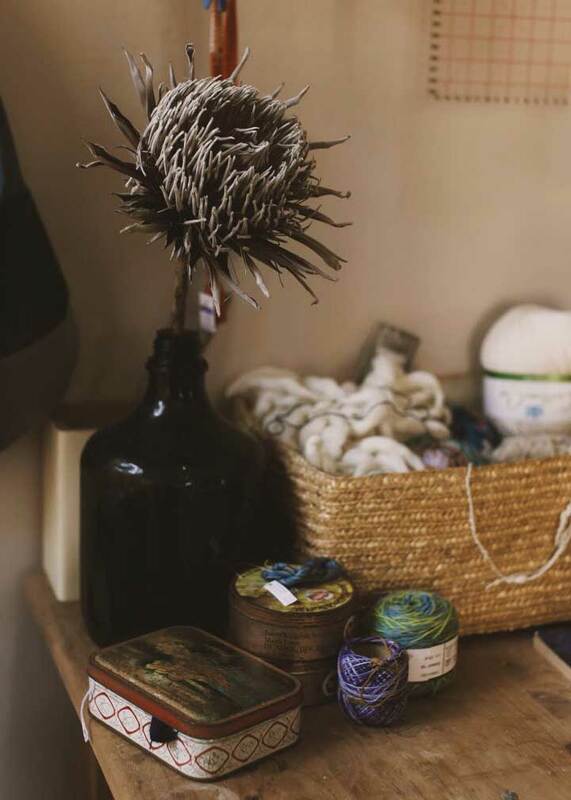 Her yarn development is created through a beautifully organic and sustainable process, stemming from her love for nature and the environment. 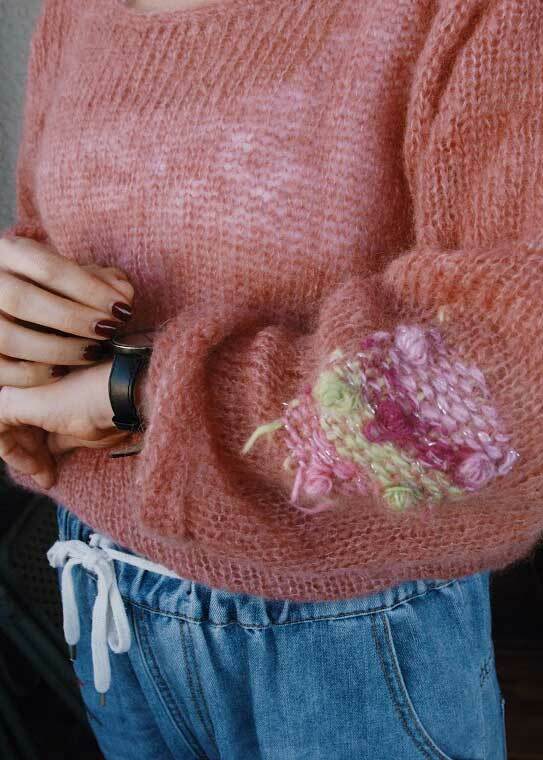 Sustainable design happens instinctively for her — she only uses natural dyes that don’t damage the earth and creates some of her most incredible yarns through upcycling and using every little bit of ‘waste’ mohair. Working with her was an extremely easy, natural process as we all shared a similar mindset and vision. Adele and the local craftswomen that she works with spent hours meticulously knitting up our designs to form part of this collection. Intricate details on one of their jerseys. Frances, wearing one of their luxurious creations. How do you emulate the values of slow and ethical fashion in your collection? Frances: Now, more than ever, we believe that traceability is vital in the fashion industry. Consumers need to become educated as to where their clothing comes from and look further than ‘who made my clothes’ to every aspect of the supply chain, starting from the land and animals themselves. End users need to be able to track the complete life cycle of their garments to check if they follow ethical and sustainable practices. We believe this is going to become a necessity in the luxury goods market. Mohair South Africa, our industry body, follows and audits a stringent set of Sustainable Industry Guidelines developed in close concert with key customers internationally to ensure global best practice. We are striving to use mohair from farms that uplift these virtues to the highest level. Van Hasselt Farming, a prototype of these kinds of farms, is exceptionally proud of being part of this industry and takes great care in upholding the highest ethical, sustainable farming practices possible. All our farming principles and protocols are intended to provide for the continued welfare of our goats that roam in a free-range environment, tended and nurtured by well-trained workers, who share our values. Our animal husbandry is not only humane and ethical, but it makes good business sense. Without the optimal health of our herds, we would not be in a position to produce the high-quality fibre on which we have built our reputation. Leandi:We also believe that to ensure production integrity, now is the time to introduce traceability measures that will allow buyers to trace the origin of fibre back to the source. Buying mohair from farms certified for their sustainability could be a game changer in building a transparent supply chain and could well serve as a model for other natural fibre industries to follow. A transparent supply chain allows consumers to trace mohair products back to its origin, where they can be sure that the farm from which their mohair comes complies with international sustainable guidelines. This should become standard practice across all fibre industries. We encourage open and transparent practices and welcome any party interested in a holistic understanding of mohair farming to visit us at any time. Angora goats are farmed for their fibre (mohair). It is in every actor of the mohair industry’s interest to see mohair flourish; this is not possible without healthy animals. Frances: The pieces we have produced are inspired by the Karoo and its natural landscapes. One cannot look or wear these pieces without being acutely aware of the uniqueness of the yarn and the way it’s constructed; ultimately making the wearer conscious of the process behind the piece. Leandi: Our time in Japan taught us to be more daring and outspoken with our colour palettes. In this collection, we broke down barriers on how colours and patterns are meant to work together, ultimately freeing up the yarn to express its qualities in the truest sense. We also embraced simple designs that allow the mohair yarns to speak in a louder voice. Our garments are timeless and can be worn through all seasons; there really is no such thing as a trend. What would you deem a successful collaboration? Frances: To fully achieve a sustainable and relatively scalable business practice; the project needs to generate a profit. That said, if this capsule collection can create a new conversation and change people’s perception of mohair and their understanding of ‘luxury’ products it would be a massive breakthrough. We hope to inspire the local and international consumer to realize the relevance of African bespoke goods. When we start putting together pieces that combine the unique strengths of our local textile industry, we can start to compete and collaborate with the rest of the world. We need to get to a point where people buy our products; not just because they tell an African story but because they are quite simply exceptional. Leandi: Beyond selling, it would be a success if the consumer is educated in terms of apparel. Through this collection they’re buying something that is unique, sustainable, and timeless. These pieces are rich in character, the story of the maker and the origins of its thread. We are not creating trend-centric pieces; we are creating clothing that will be looked after, worn with subtle confidence and gets passed down through the generations. Now is the time for South Africa to embrace this amazing fibre and show off mohair designs as the new luxury. 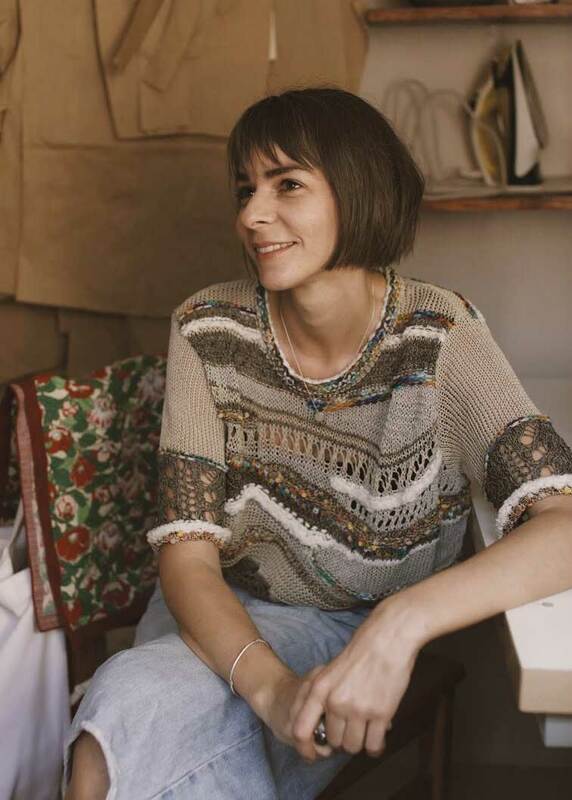 Frances van Hasselt | Frances is an entrepreneur with a specific focus on developing African textiles. She aims to create awareness and develop the South Africa mohair industry to be recognised as the home of quality mohair products. Frances places a huge emphasis on sustainable business practices and helps to preserve and celebrate traditional craftsmanship in rural communities. 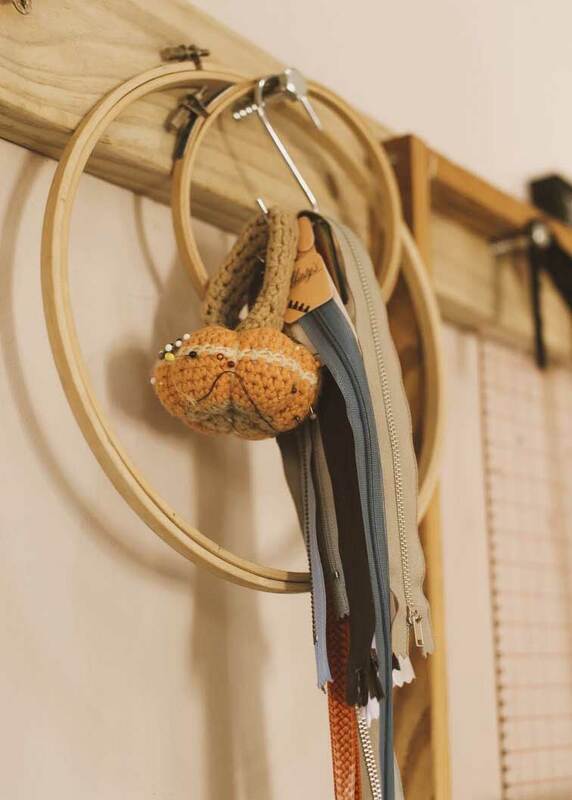 Leandi Mulder | Sustainability is central to Leandi Mulder's designs, a mentality that has pushed her to create the most appealing creations, many of which have won her acclaim in the local fashion industry. Her knack for Japanese not only played an influential role in her design aesthetic but is also a language skill that proved invaluable during their residency.